I’m finishing my second year working on the pro-life issue portfolio for the Virginia Catholic Conference and it seemed appropriate to reflect on the dignity of life during October: the month the Church recognizes as Respect Life Month. This year the USCCB theme for Respect Life month is “Each of Us is a Masterpiece of God’s Creation.” Often it seems that we focus so intently at the beginning of life and working towards a world with no abortion, that thinking about issues confronting us all at the end-of-life takes a backseat. I find it easy to understand that an unborn child and infant are God’s masterpieces- babies are adorable and innocent. However, difficult questions of faith confront me when I think about people suffering with illness or loneliness at the end of their lives. Yet, we are all God’s Masterpieces from conception to natural death. 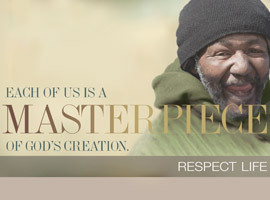 Central to the God’s Masterpiece theme is recognizing within each of us that we ourselves are one of God’s masterpieces. All life is precious, including our own. This important component is often lost in our frenzied lives and in our desire to take care of everyone else without thinking about our own needs. Now this isn’t a blog post solely about pampering yourself and taking care of your needs (However, please do those things at least occasionally). But as pro-life Catholics have we thought about how we will address our needs later in life or during a worst case scenario? Fortunately, several years ago Virginia’s bishops published Advance Medical Directives (that comply with Virginia law) to aid Catholics making these often difficult end-of-life decisions. (Click here for the instruction document and here for the actual Advance Medical Directive document.) Obviously, these documents are optional. But they enable Catholics to appoint a health care agent and identify what treatments should be used if the patient is unable to make the decision him/herself. The accompanying Question and Answer document provides excellent information about Church teaching in tandem with medical terminology and treatments. These are simply resources to answer frequently asked questions about faith and medical care. An attorney can provide answers to legal questions. A well-rounded respect for life is an essential component to our Catholic faith. All life- even people experiencing illness or grave injury- is God’s Masterpiece.